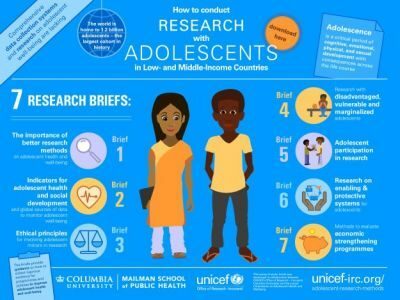 (6 March 2018) With 1.2 billion adolescents under its global mandate, it is crucial for UNICEF to identify the right periods or “windows of opportunities” for cost-efficient, scalable interventions to improve adolescent well-being. Over the past decade, a growing body of scientific knowledge has improved understanding of how experience and environment combine with genetics to shape the adolescent brain. Advances in neuroscience reveal that the adolescent brain is still a work in progress, offering a crucial second window of opportunity to influence the development of children in their second decade of life. 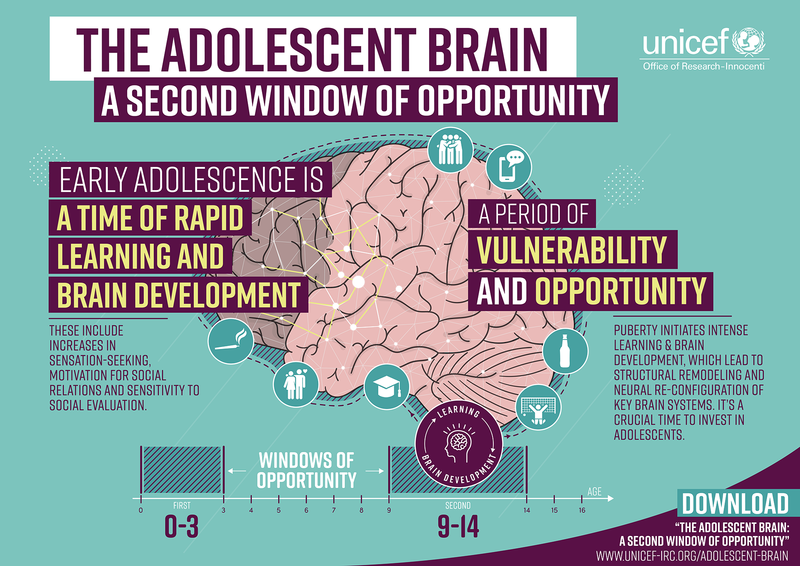 In The Adolescent Brain: A second window of opportunity, a new compendium publication produced by UNICEF Innocenti, eight experts in adolescent neuroscience present emerging findings from their research. Using accessible language, the main aim of the publication is to foster better collaboration between the scientific research community and social service providers to better counteract the effects of trauma and vulnerabilities and lay a better foundation for optimal adolescent development. The compendium builds on the discussions initiated at the 2016 symposium of the same name hosted at UNICEF headquarters, where presenters delivered their findings to review the state of science related to adolescent brain.“Evidence from neuroscience.” said Nikola Balvin, one of the UNICEF Innocenti editors, “was really important to galvanizing support for early childhood development investments, for changes in policies, interventions for young children. With this compendium, we are building on what we know from early childhood development and early investments made during that period, to understand better what is going on in the brain of adolescents”.The commentaries summarize the positive and negative impacts on brain development, including the effects of poverty, violence, stress, technology, but also socio-emotional learning, stress management, nutrition, counselling and positive relationships. 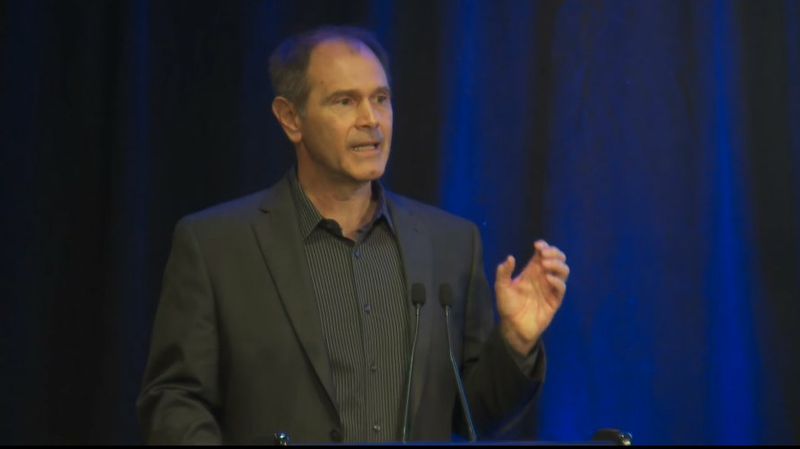 Ron Dahl, University of California, Berkeley at the Adolescent Neuroscience Symposium at UNICEF in New York, United States. Ron Dahl and Ahna Suleiman, from the University of California Berkeley, focus on early adolescence and highlight the transition from childhood to puberty as an experience leading not just to physiological changes, but also to structural remodeling and neuronal reconfiguring of the adolescent brain, with particular impact on neural circuits involved in processing emotions, risks, rewards and social relationships. Behavioral and emotional patterns experienced across adolescence can spiral into positive or negative outcomes as a result of complex interactions of social, emotional, psychological, behavioral and neuro-developmental processes. Suparna Choudhury from McGill University, discusses the concept of ‘situated brain’ and reflects on the influence of culture on the development of the adolescent brain, challenging the culture/brain dichotomy as false. On the one hand the human brain is a fundamentally social brain which has evolved to have a biological preparedness to negotiate complex social groups and acquire culture; on the other hand, culture and biology interact to create different experiences of what can be considered ‘biological processes’. Neuroscience has often been criticized for missing causal evidence, and providing only correlational evidence. The commentary by Kimberly Noble from the Columbia University tries to debunk this belief by presenting the first ever randomized experiment testing the causal connections between poverty reduction and brain development. A longitudinal study tracking low-income families in the US will assess the causal impact of unconditional cash transfer on cognitive and brain development of children through adolescence and beyond. With poverty affecting one billion children and adolescents across the globe, disentangling links between socio-economic disparities, experiences and brain development represent a critical priority for future research to maximize the potential of adolescents with policy programming and advocacy. 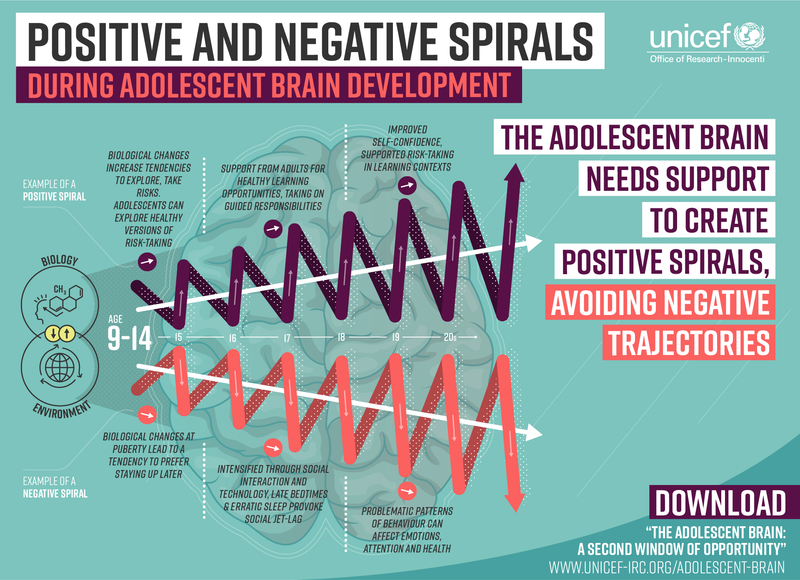 “Because we are interested in holistic approach to adolescent well-being” Nikola Balvin says “neuroscience helps to understand what happens in adolescent brains and how programmes and policies we advocate for can respond to that”. The effects of stress on well-being and mental health of children and adolescents are reviewed in the commentary of Sonia Lupien from the University of Montreal. She describes how the developing brain is particularly sensitive to the effects of stress with a chronic production of stress hormones affecting learning, memory, emotional processing and mental health. Resiliency programmes which help children to cope with biological and environmental stressors can lead to great benefits in physiology and mental health. Elizabeth Ward, chairperson of Violence Prevention Alliance in Jamaica illustrates the benefits of programmes like BALANCE which assist adolescents to un-learn and re-learn behaviors that minimize risk-taking activities. Finally, Melina Uncapher from the University of California shares her research on action video games and other interaction with technology. A growing body of evidence from neuroscience and behavioral science proves that playing action video games has beneficial effects on the adolescent brain, including improving decision making; speed of processing; ability to overcome attention capture; ability to remember visual information and multi-tasking ability. However, the positive effects of such games must be balanced with their potential negative effects such as aggressive thoughts, and lack of exercise, social engagement and interaction with the natural environment. A healthy “technology diet” is necessary. As research on the impact of technology on developing brains is still recent, much more research is needed to understand how, when, where and in what combinations technology consumption can be beneficial or harmful for adolescent brains. The compendium has been designed to encourage further dialogue to bring neuroscience research to bear on programme interventions and public policies for adolescents.